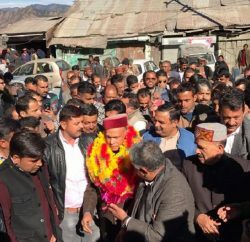 BJP veteran leader and Former Himachal Chief Minister Prem Kumar Dhumal terms Virbhadra Singh led Congress Government in state as anti-people and believes that it’ll lost all four seats in the state. 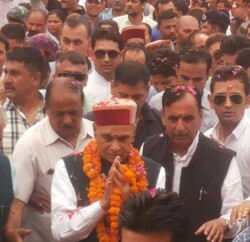 In a press statement, Prem Kumar Dhumal stated that as a representative of the people and Leader of Opposition he has every right to say that Virbhadra government will stand dismissed as the election results on May 16 will emphatically prove beyond doubt that the people have withdrawn from Congress the thin mandate they gave it in assembly elections. Dhumal said Virbhadra government enjoys the bare minimum support of 35 MLAs with one seat vacant and one Congress MLA behind bars facing charges of murder and moral turpitude. He regretted that “morally high” Congress and Virbhadra Singh have not so far expelled from Congress the MLA in jail for the last 16 months. Leader of Opposition believed that once the Congress loses all the four seats Congress high command itself will show the door to Virbhadra Singh whose conduct is already under investigation for corruption by the CBI and is involved in many other such cases. Former CM said it is more than certain that Narendra Modi will be the prime minister of the NDA government after May 16. With Congress losing power at the Centre and Virbhadra getting a severe drubbing in Himachal, those in the Congress legislature party and those independents supporting it from outside will themselves desert Virbhadra’s sinking boat to save their own future. 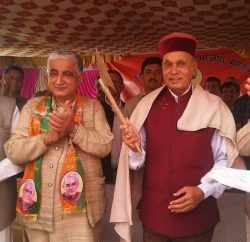 With Virbhadra Singh losing his saviours at the Centre and Himachal people withdrawing their mandate, Dhumal said, the Congress government in Himachal will collapse under its own weight and contradictions like a house of cards.